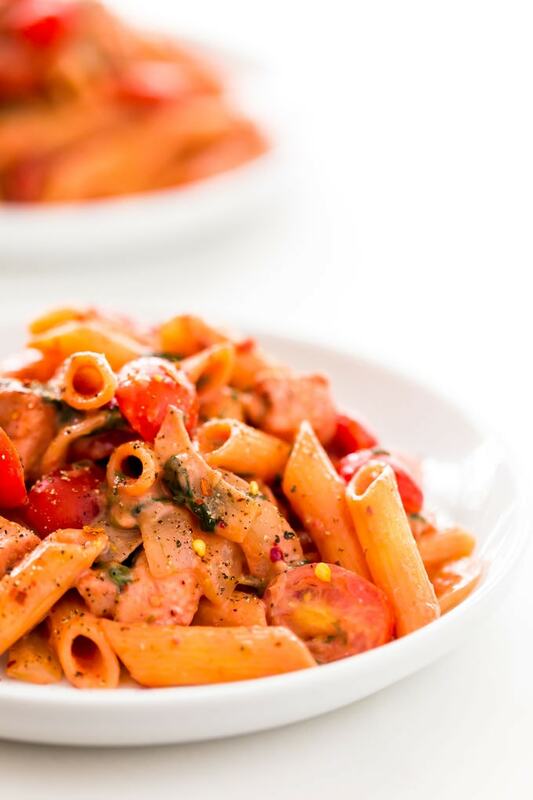 Red Pesto Pasta – One-Pot, Ready Under 30 Minutes! 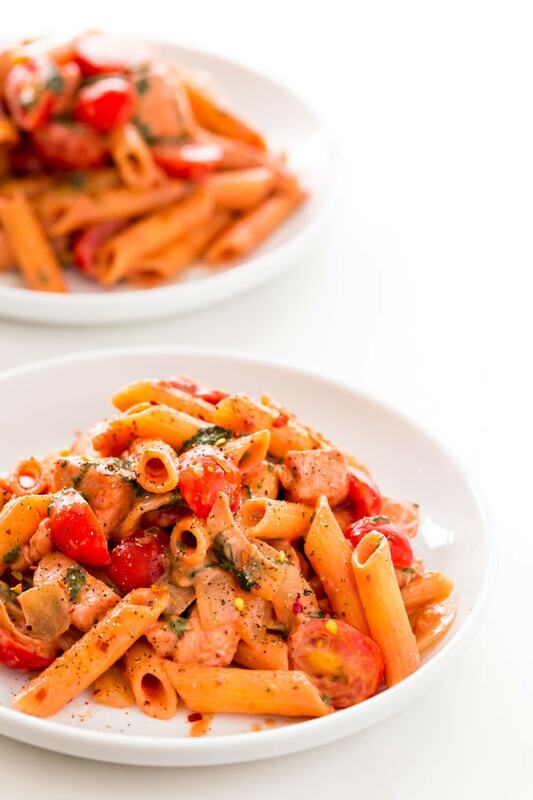 Ready under 30 minutes using only one pot, this delicious red pesto pasta recipe is the perfect weeknight meal. 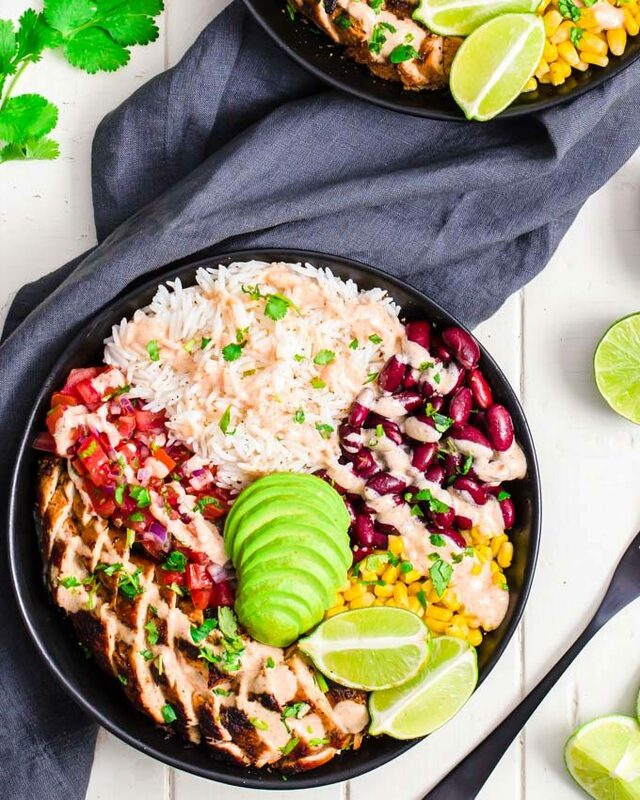 Full of veggies, healthy to boot and super easy to make, this gluten-free comfort food dinner instantly became a family favorite in our house. Sun-dried tomato pesto was used for this recipe but roasted red pepper pesto would taste great, too. This recipe is also fully gluten-free and dairy-free. I still can’t believe how easy and delicious this gluten-free pasta dish was. 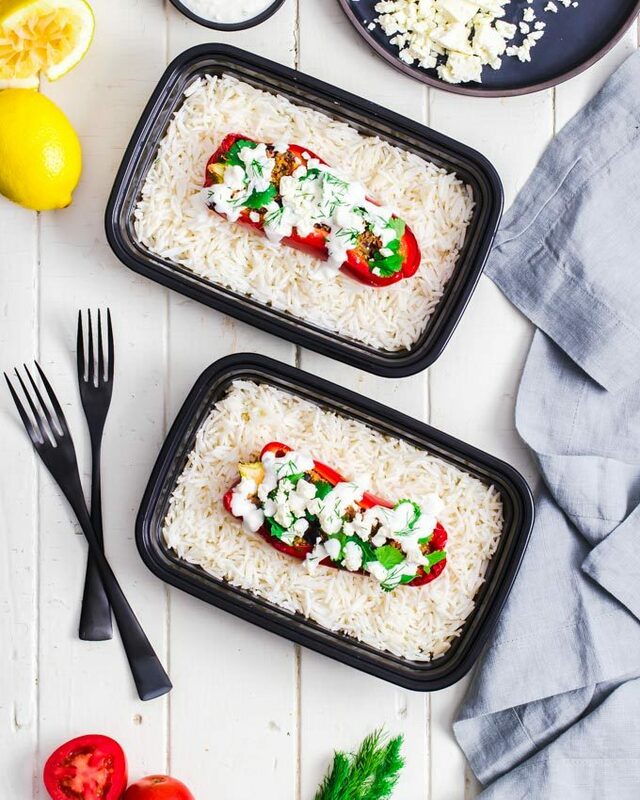 Ready within 30 minutes, from start to finish, this recipe is a must-have in your weeknight survival toolkit. Got some leftover chicken? Are you in dire need of some fresh ideas to make something memorable out of it? Seek no more. I got you covered, this recipe is the one. Like my healthy sloppy joes, this recipe only requires one bowl and is so quick to make. You’ll never want to make boxed mac n cheese again. This is SO much better (and healthier). Promise. 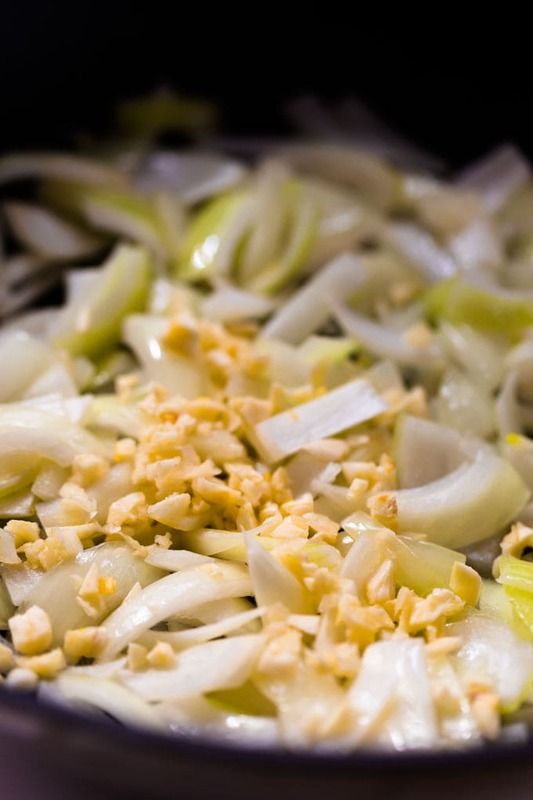 Start by sweating the onion slices in olive oil over medium heat in a large skillet, for 2 minutes. Then, stir in the garlic and sweat for an additional 30 seconds to a minute, constantly stirring. Important: In case you did not know, sweating means gentle heating of your vegetables so they start emitting liquid and become more tender. When sweating, if your vegetables turn brown, you either didn’t stir often enough or there was simply too much heat. So, when sweating the onion, it should become tender and translucent NOT golden brown. We’re not trying to caramelize the onion for this particular recipe. 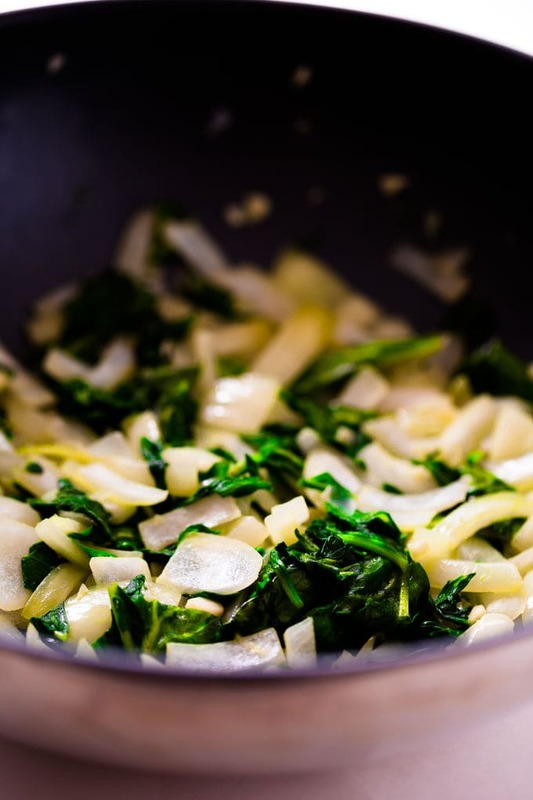 After you finish sweating the garlic (30 seconds to a minute, as mentioned above) add in the baby spinach leaves and sweat for an additional 2 minutes, or until the spinach leaves are completely wilted. Now stir in 5 cups unsweetened almond milk and cover. The type of almond milk used should be entirely flavor free, this is obviously important. Note: You could also use any milk of your choice, as long as it is sugar-free and plain. I used almond milk here only as a matter of personal preference and dietary restriction. 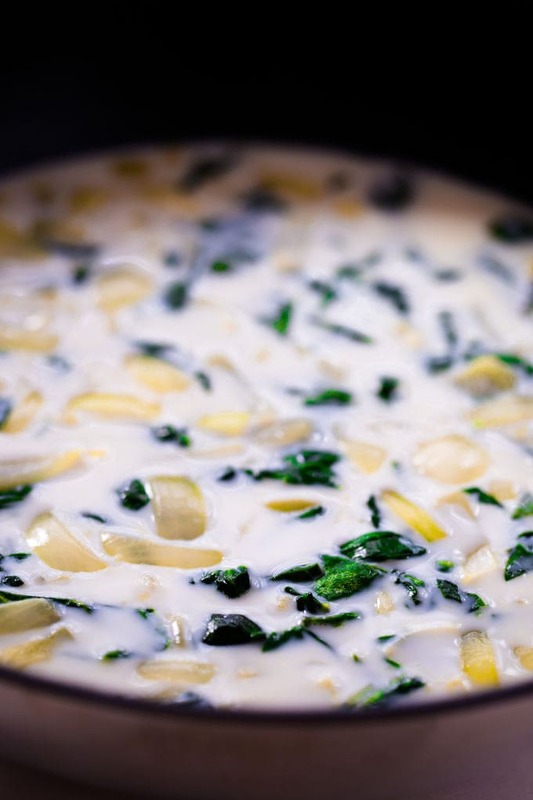 As soon as the milk starts to bubble (this should take about 5 minutes), reduce heat, stir in the pasta, cover and simmer for about 10 minutes, stirring occasionally. 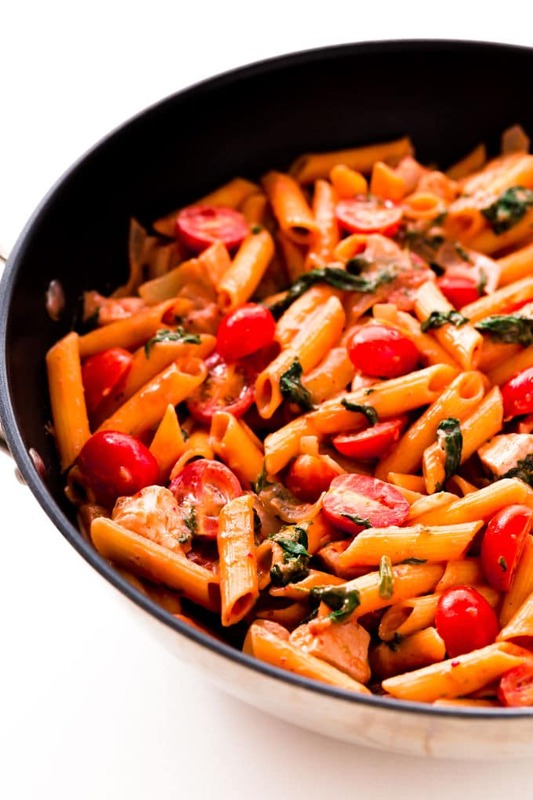 Cooking time may vary, so make sure you test the consistency of your pasta before going any further with the recipe. When satisfied with the texture of your pasta, remove from heat and stir in the rest of the ingredients and stir gently. This recipe is both gluten-free and dairy-free, but please note that you don’t HAVE to use gluten-free pasta, any type of pasta will do. The same thing applies to the type of pesto used: I put dairy-free pesto but any red pesto will do the trick. You could replace nutritional yeast with 1/2 to 3/4 cup parmesan cheese if your diet allows for it. If your pasta is still too hard after 10 minutes of cooking and there is not much liquid left, add some more milk (start with 1/4 cup). This might happen if there was too much heat and too much liquid has evaporated from the skillet (even with a closed lid). For a Vegan Version: Replace chicken with the same amount of cooked broccoli or roasted eggplant cubes. To save you some time, you may cook those while the rest of your ingredients are cooking. Add them to the skillet at the very end. What type of pesto should I use? I used sun-dried tomato pesto but roasted red pepper pesto is also fine. Use the one you prefer! Barilla sells a good dairy-free sun-dried tomato pesto. What type of pasta should I use? I used gluten-free corn penne pasta as I found the texture of these are very close to traditional wheat pasta, but in reality, any pasta will get the job done. One thing to note: I have tried this recipe with spaghetti and I do not recommend it. 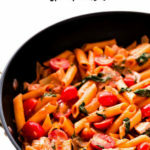 I found penne to be perfect for one-pot pasta. Rigatoni, fusilli or farfalle would also be great choices. 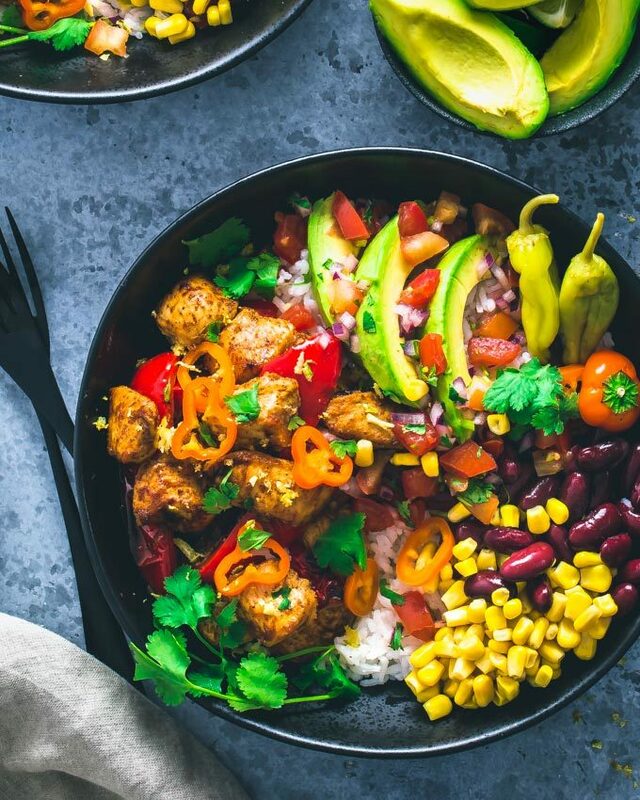 What is a good wine pairing for this dish? This article from Wine Folly should point you in the right direction. 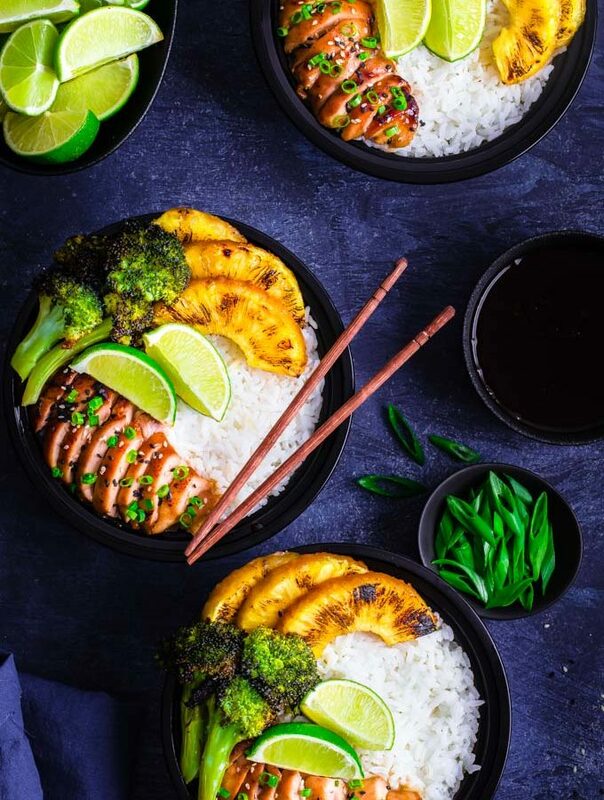 Can I use shrimp and/or scallops instead of chicken? Yes, absolutely! I actually love that idea and will definitely try it! 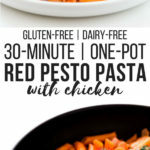 How to make my own dairy-free/vegan red pesto pasta? Here is an excellent recipe for vegan sun-dried tomato pesto from Simply Quinoa. Can I use green basil pesto instead? Yes, absolutely. 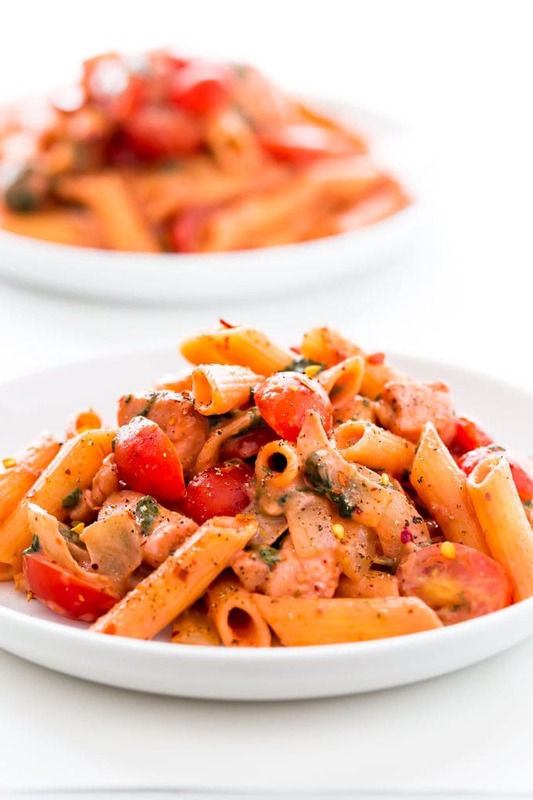 This sun-dried tomato pesto pasta dish will be on your table within the next 30 minutes. This super easy to make weeknight dinner also requires only one-pot and will serve up to 6 people. Heat 2 tbsp olive oil in a large skillet over medium heat. Sweat the onion slices for 2 minutes. Stir in the garlic and sweat for an additional 1 minute. Stir in the baby spinach leaves and cook for 2 minutes, constantly stirring, or until the leaves are completely wilted. Add the almond milk and stir. Continue cooking, covered, for about 5 minutes or until the milk starts to bubble. As soon as the milk starts bubbling, stir in the pasta. Cover and simmer, stirring occasionally, for 10 to 12 minutes or until pasta is al dente and most of the liquid is absorbed. Remove from heat and stir in the red pesto, cooked chicken, nutritional yeast and baby tomatoes. Stir gently. * Cook 1 lb raw chicken to get 2 cups cooked chicken. For a Vegan Version, replace chicken with the same amount of cooked broccoli or roasted eggplant cubes. You may cook those while cooking the rest of your ingredients to save some time.